Compatibility: Requires iOS 10.6.6 or later. FaceTime for Mac makes it easy to talk, smile and laugh with friends and family on their iPhone 4, iPad 2, iPod touch or Mac. Getting started is quick and easy — simply enter your Apple ID and you're ready to go. 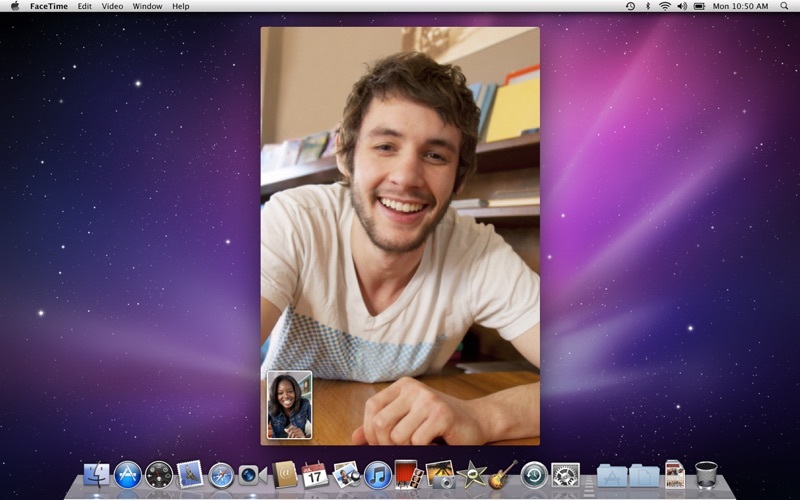 Whether you're talking to someone on an iPhone or on another Mac, video calls with FaceTime look great. There's no better way to keep all your favorite faces just a click away. Simple to Get Started • Setup is quick and easy – just enter your Apple ID. 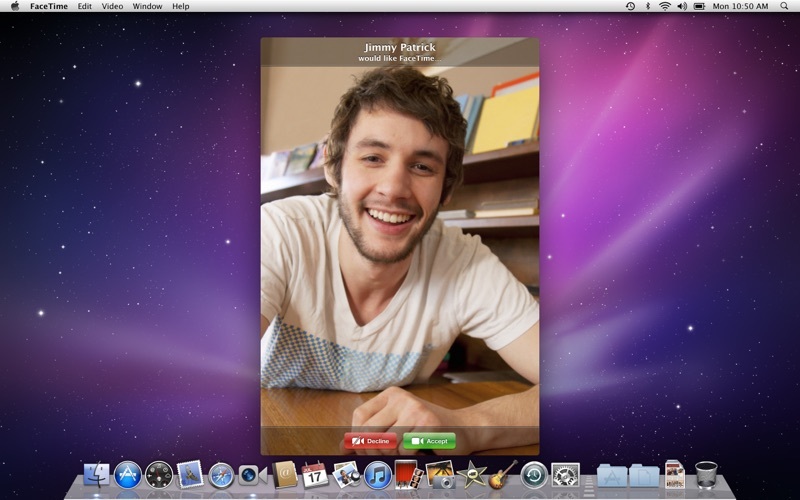 • With just one click, you can make a video call to an iPhone 4, iPad 2, iPod touch, or another Mac. Easy-to-Organize Contacts • Make calls using your existing Address Book contacts – you don’t have to enter your contacts from scratch. • Add the people you call most often to your Favorites list. • Quickly review your past calls with Recents. High-Definition Video • Receive HD video calls at up to 720p on supported, Intel-based Macs. * • A Mac with a standard-definition camera delivers up to VGA-quality video for Mac-to-Mac calls. Elegant Interface • Window and playback controls fade away so the focus stays on your conversation. • View transitions smoothly when an iPhone 4, iPad 2, or iPod touch user switches from front to rear cameras or from portrait to landscape views. 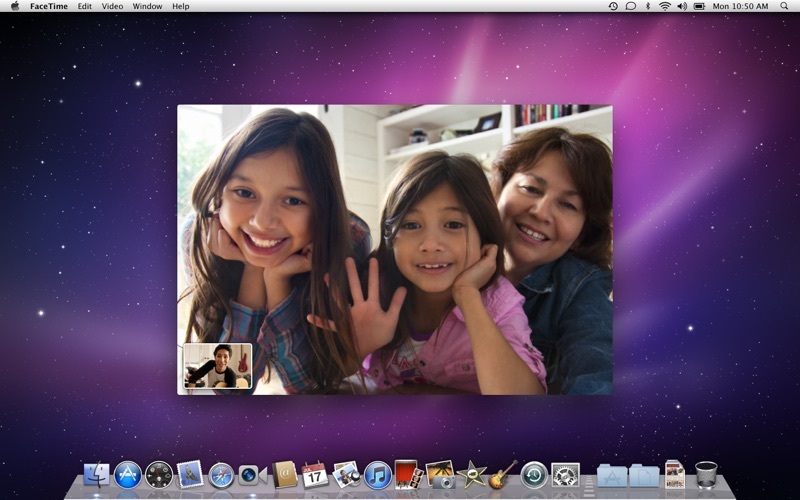 • FaceTime's widescreen aspect ratio makes it easy for families and groups to participate in a call. • Enjoy your video call full screen, using every inch of your beautiful Mac display. Ring Anywhere, Any Time • Incoming calls ring on your Mac, even if FaceTime isn’t running. • If you have more than one Mac, incoming calls ring on every one so you can answer on the Mac that’s most convenient. 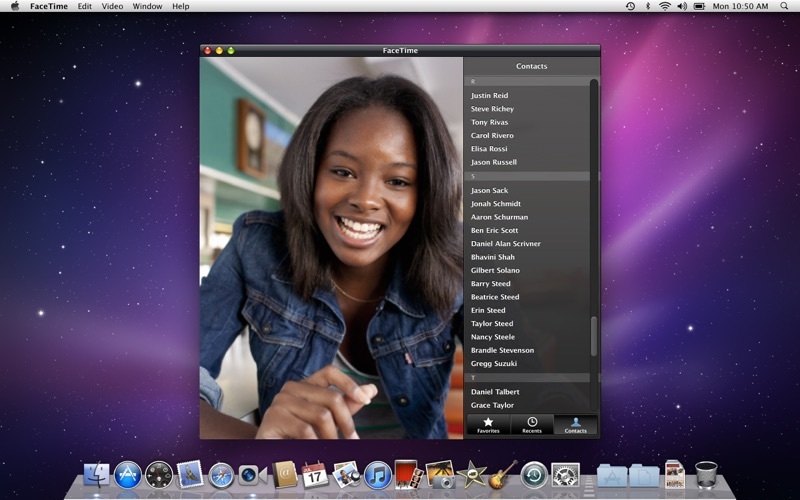 *Video calls require a built-in FaceTime camera, an iSight camera (built-in or external), a USB video class (UVC) camera, or a FireWire DV camcorder; and a 128-Kbps upstream and downstream Internet connection. 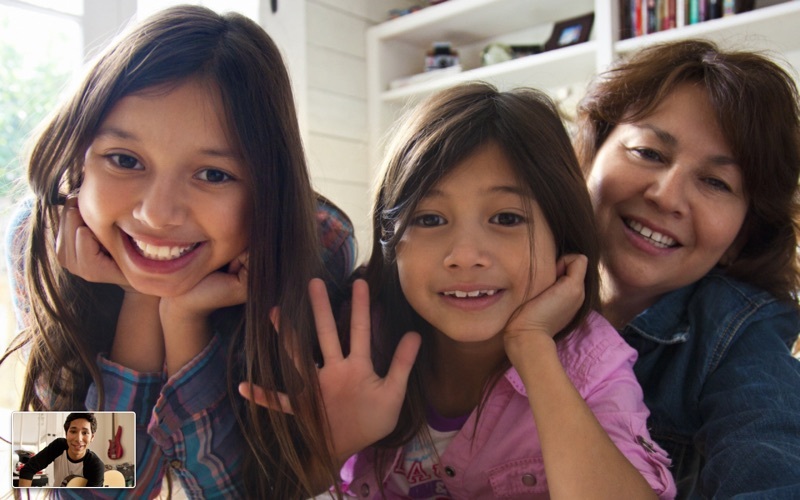 Making HD video calls requires a built-in FaceTime HD camera and a 1-Mbps upstream and downstream Internet connection. Receiving HD video calls requires a supported Intel-based Mac. (for a complete list, visit http://support.apple.com/kb/HT4534). Failed connection, but my wiresless is working fine. I recently purchased this app to use on an older MacBook with Mac OS X Snow Leopard, and started using this app on it. It is wonderful. It works just like FaceTime does on new Macs with the built-in version of the app. Easy and simple, yet so powerful. Use it to talk with friends all the time, and it makes staying in touch with people when traveling/out of town really easy! after reinstalling w purchase, facetime will not let me log in. it sent the notification to my phone, and i hit allow, it gave me a verification code with instructions, which were followed, but it just comes up server error. tried with two separte apple ids. I just bought this app= WASTE OF MONEY. When the other individual calls me, the call turns off by itself. When I call someone else, the app shuts down randomly. I demand a refund. I am extremely frustrated with Apple. I downloaded the newest OS version, High Sierra. Apple lets you buy the application. Then, when you go to install, you get an error message stating, "FaceTime can’t be installed on “Macintosh HD” because the version of macOS is too new.” Come on Apple, really? I would appreciate having my money back, since this app doesn’t even work! THIS IS BUILT IN ON NEW MACS AND MAC OS! If you have a Mac running a Mac OS from 2014 or newer, you already have this. Mac OS X 10.7 “Lion” or newer has this built-in. This purchase is only for users of Mac OS X 10.6 “Snow Leopard” - a very old version of the Mac OS. Running this on an old (first generation) MacBook Pro from 2006, running Mac OS X 10.6.8 “Snow Leopard”, it works fine for me, connecting to friends/family using FaceTime on iPhones, iPads, or newer Macs. FaceTime won't let me sign in using my Apple ID and (correct!) password. I've re-set it three times and entered all the two-step verification codes. I have no problem signing into the App Store (which is how I'm writing this review) and my Apple ID online (where I also tried an app-specific password, without success). Nothing works. Can't sign in. Waste of time and $0.99.